Art Cologne has applied Ludwig Mies van der Rohe's aphorism “less is more” to its 53rd edition at Koelnmesse trade centre, 11-14 April, which coincides with the Bauhaus centenary. By reducing the number of exhibitors from 210 to 176, the focus is on quality over quantity, the organisers say. The fair’s director Daniel Hug has integrated the emerging Neumarkt galleries and the Collaborations section (for presentations by two galleries)—both previously on the second floor—into the first floor alongside more established contemporary galleries. Modern and post-war art, and what Hug calls “classic contemporary” (cue a Lee Ufan solo show at Kamel Mennour), remain on the lower ground floor. The restructuring has been greeted positively by exhibitors. “It creates a better visibility for the Collaborations sector and a better flow of visitors,” says Jonas Kriszeleit, an associate at Esther Schipper (Berlin) which is presenting Julia Scher's works with surveillance cameras from the 1990s and 2018 in collaboration with Drei (Cologne). “If collectors take five hours to say 'Hello' to everyone, they'd never make it onto a third floor,” says Philippe Joppin, the co-founder of first-time exhibitor High Art (Paris). “The bigger the fair, the more young galleries disappear as collectors go to the galleries they know rather than make discoveries.” High Art is showing duo-form, gestural and performance-based oil paintings by Aaron Garber-Maikovska, priced from $9,000-$75,000. Sales at Art Cologne can take time: “It's a very, very slow fair with few people around,” Mario Cristiani from Galleria Continua (San Gimignano/Les Moulins/Beijing/Havana) laments. Returning to the fair after a few years away, he has sold a painting by Qiu Zhijie, priced at €100,000. “We came back to see the situation in Germany,” he adds. Indeed, the longstanding history of Cologne's collector base is alluring. “We decided to participate in order to consolidate and develop our European network of collectors; it's easy to see German collectors again at Art Brussels or in Basel,” Constance Dumas, director at first-time exhibitor Nathalie Obadia (Paris/Brussels), says. The stand has sold several pieces, €8,000-22,000, from its solo show of Joris Van de Moortel's mural sculptures, blending Hans Holbein references into paintings combined with music. The changes have not affected the Modern and post-war floor's atmosphere. 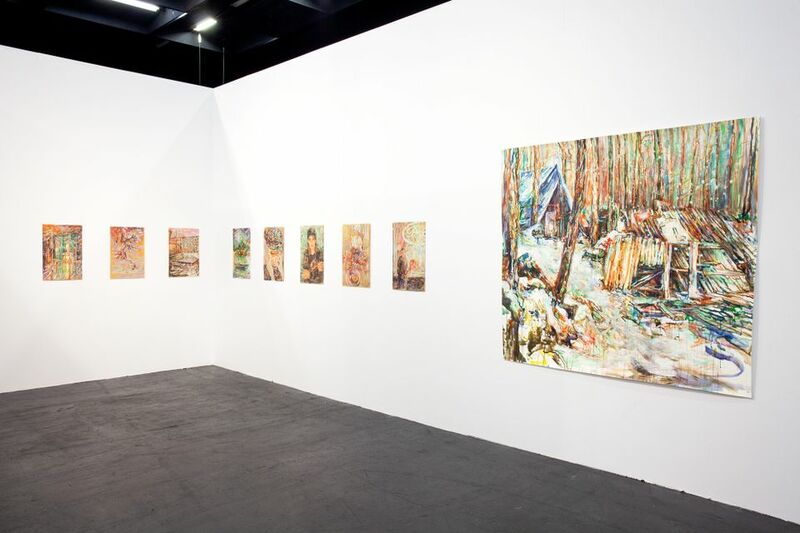 “Art Cologne has an old, established tradition and for me it's always the same,” says Alexander Baumgarte, the director of Samuelis Baumgarte (Bielefeld, Germany). The gallery is displaying works from the late 1950s to 2018 by Heinz Mack, who in 1957 with Otto Piene co-founded the ZERO movement in nearby Düsseldorf, experimenting with materials, light and movement. Besides one of Mack's recent paintings in rich bands of colour (price: €320,000), it has sold a Sam Francis painting. Other early sales include Rita Ackermann's blurred and erased drawings and paintings, priced $20,000-$120,000, at Hauser & Wirth. The impact of people staring at smartphones to the detriment of their personal lives is explored by different generations of artists. 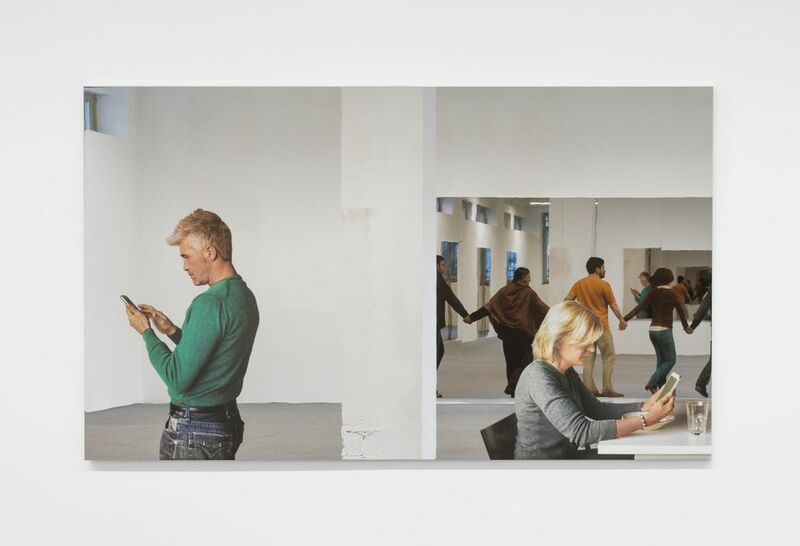 Michelangelo Pistoletto's painted mirrors, priced at €500,000, are at Giorgio Persano (Turin) while Galerie Thomas Rehbein (Cologne) has found buyers for nine small-scale paintings, €500-€7,300, of people glued to their phones by the young Belgian artist Joëlle Dubois.